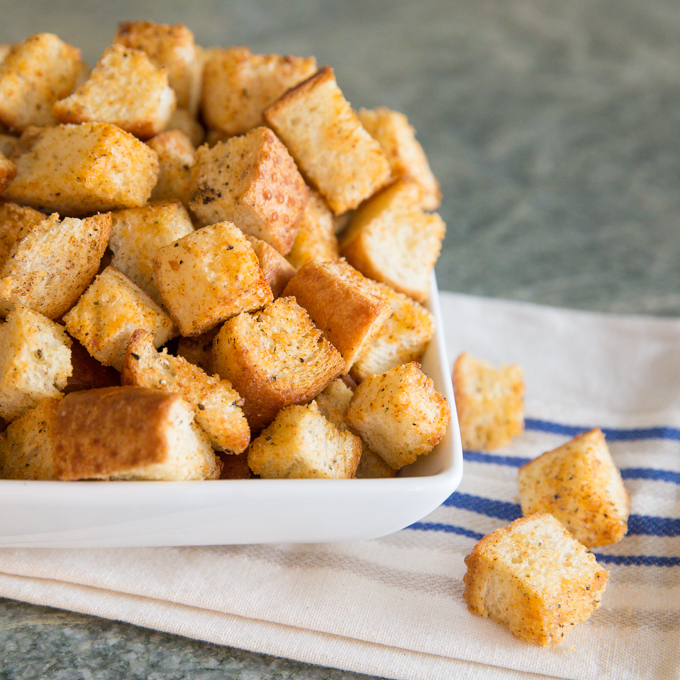 Once you make homemade toasty croutons, you’ll never go back. They are so full of flavor and you’re in control of the crunch factor! Simply bake for a shorter period of time if you prefer a softer crouton, or add a few extra minutes to the baking time if you like them really crunchy. Making croutons is a perfect use of leftover garlic bread, but since we never have left over garlic bread, I buy a loaf specifically for making croutons. Homemade croutons are perfect on any salad, but my favorite is as a topping on my Caesar Salad. The combination of the creamy caesar dressing with the topping of homemade flavorful croutons is true salad perfection in my mind! To prepare croutons, start by slicing your french bread in half (lengthwise). Butter both halves & sprinkle with about 1 tsp of the garlic powder. Cut french bread into cubes in place into large bowl. Combine in small bowl: remaining garlic pwd, paprika, Mrs Dash, salt & pepper. Drizzle olive oil over bread cubes and sprinkle with spice mixture. Mix well (I use my hands, but feel free to use a spoon). Place seasoned cubes on baking sheet. Cook croutons in 325• for approx 20-30 minutes. Turn croutons about every 10 minutes. Cooking time will vary depending on desired crispness. Cool on sheet pan. They will continue to crisp up as they cool. I store mine in a ziplock bag.